With the FIA WEC super season nearing its kickoff this May, many LMP1 manufacturers and privateer teams have announced their intention to participate. With the loss of Audi at the end of 2016 and Porsche at the end of 2017, I figured LMP1 all but dead, but things seem to have rebounded a bit with a bigger field than we’ve seen for a few years, actually. 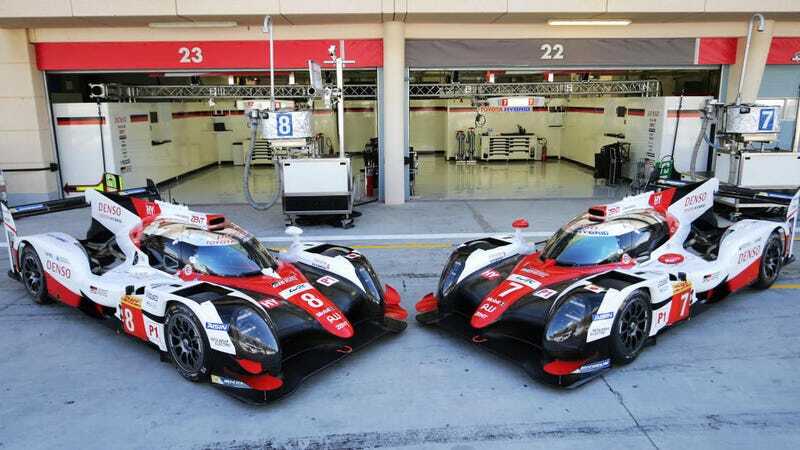 The WEC has committed to a fair balance of performance between the hybrid and non-hybrid LMP1 cars, giving the privateers a chance to take the fight directly to the OEMs, which they have never been able to actually achieve, despite years of lip service. Here’s hoping that the series arrives with a competitive grid and excellent racing it has been shown to be capable of producing in the past. We could see as many as a dozen competitors this year. But I digress, here is a rundown of the cars that will be competing for WEC and Le Mans overall victory. After two highly-public and embarassing years of failure at the French classic 24 Hours of Le Mans, Toyota is out for blood in 2018. While they are using a car that is largely an updated version of their 2017 car, don’t expect the TS050 to be a slouch. Toyota has shown a lot of speed, and if they can harness a bit of luck, they should have no trouble being fast for 2018. Drivers: Toyota have not yet announced their 2018 driver lineup, but they are likely to stick with most, if not all, of their 2017 drivers. Mike Conway, Kamui Kobayashi, Jose Maria Lopez, Sebastien Buemi, Kazuki Nakajima, and Anthony Davidson are likely drivers. Formula One ace Fernando Alonso tested with the team at the end of the 2017 season, and looks likely to step in to the car for Le Mans this season. After running as also-rans in LMP1 for a few years, Rebellion Racing swapped to LMP2 for the 2017 season and won the championship, and they have decided to step back up to LMP1 for the 18-19 mega season. The team have an excellent relationship with Oreca, and should be debuting their cars at the Geneva International Motor Show in March. Drivers: Rebellion will be running two cars with a stellar driver lineup. Keep an eye on these folks to do some serious work in the next season. Bruno Senna, Mathias Beche, Gustavo Menezes, Neel Jani, André Lotterer, and Thomas Laurent will share a pair of Oreca LMP1s. Ginetta has taken the covers off of their 2018 competitor, the G60-LT-P1 chassis during the UK’s Autosport International Show. The car is shown in TRS Racing/Manor livery, and marks the manufacturer’s 60th year in competition. Ginetta claims they’ve sold a total of four of these chassis, but only Manor have announced their intention to run this year. Manor have not yet announced which engine will power their LMP1, or who will drive it. The BR1 chassis has been engineered by Russian company BR Engineering and implemented by Dallara’s chassis works. The car was officially unveiled in bare carbon during the 2017 season finale in Bahrain. Drivers: American-based Dragonspeed Racing is the first LMP1 team in history to wear the stars and stripes as their flag. They’ll run a single car with an as-yet-undecided engine. The team are still working out driver contracts for the 2018-19 season. SMP Racing will run a pair of BR1 cars for 2018-19, after sitting out of the series in 2017. The team have currently committed to only Vitaly Petrov and Mikhail Aleshin as drivers, and will firm up the remainder of their driver lineup as the season nears. ByKolles ran only the first four rounds of the 2017 season. After proving that their car was only slightly faster than the LMP2 field, the team decided to head back to the drawing board in order to be better prepared for 2018 than flounder for the remainder of 2017. The Enso CLM P1/01 chassis is largely a development of the chassis which debuted in 2014 under the Lotus nameplate. This car is powered by a Nissan V8 engine. Drivers: The Austrian-based team recently underwent rigorous testing of the car at Aragon in Spain. Test drivers included ByKolles regulars James Rossiter and Oliver Webb. Joining them were newbies Tom Billmann (former Venturi Formula E driver), Mikael Grenier (current European Lamborghini Super Trofeo champion), and Edoardo Liberati (2016 GT Asia Champion). While Perrinn had previously announced that they’d sold two LMP1 cars-allegedly to be branded Dacia-for the 2018 season, they recently pulled the plug on the project. Instead of the more traditional LMP1 car, they’ve now shifted their focus to build a full electric racer in a bid for the 2019 Le Mans Garage 56 entry.